Seafood That Wear Halloween Costumes Year Around! The spookiest time of the year is right around the corner! Before you know it, you’ll be at Halloween parties featuring the spookiest appetizers imaginable. We’ve all witnessed the appetizer that looks like a gelatinous brain, and we shiver; but then upon tasting it, we realize it’s actually quite good! Our goal this week is to create an appetizer that does just that! Look for that soon. Meanwhile, let’s talk about some of the spookiest looking sea creatures; The ones that look a bit scary, but taste fabulous! First up are monkfish! We love monkfish. We’ve written an entire blogpost on monkfish, that’s how much we enjoy them! But the sight of a monkfish, whole, may throw you off. Their heads are large, broad and flat, they have tiny eyes and an enormous mouth filled with razor sharp teeth. Both their pectoral and ventral fins function as feet, allowing them to walk on the bottom of the sea. They also have three long filaments sprouting from their heads. As with all anglerfish, the longest filament is moveable in all directions (to lure their prey toward their giant mouth). Last but most certainly not least, monkfish have distended stomachs, allowing them to swallow prey—whole—as large as themselves. Next up are sea urchins! 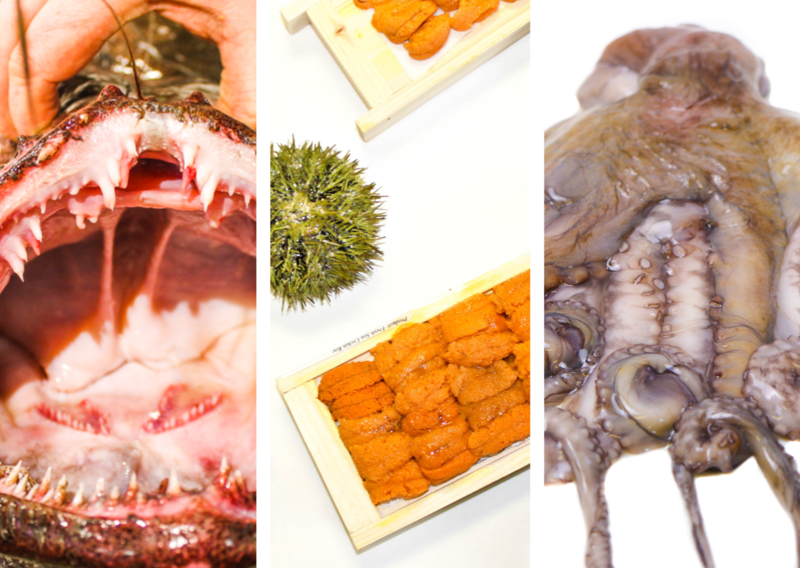 Sea urchins are more recognizable than monkfish, but that doesn’t make them any less scary looking! They are essentially a spiny ball. Urchins inhabit all oceans on earth and live along rocky shores as well as in depths as deep as 16,000 feet. They move slowly using their tube feet and are sometimes assisted by their spines. Sea urchins have a rich fossil record dating back 450 million years. Now, can sea urchins be eaten? The answer is absolutely! They are actually considered a delicacy in several cultures. Although their tests (hard shell) are inedible, the gonads of both male and female urchins (roe) are very tasty! Each culture has their own unique way of eating the roe. In Mediterranean cuisines, they flavor scrambled eggs, omelets, and mayo with the roe. In Chilean cuisine, it is eaten raw with lemon, onions and olive oil. One of the largest exports of urchin roe is Japan. The Japanese refer to sea urchin as uni, which is a word you may see at restaurants around town! Our favorite way to use uni is to make a butter from it. Uni butter is fantastic in pasta dishes! Next up on the list of seafood that may scare you prior to cooking are octopuses. Honestly, they may still scare you after cooking as well, but they sure are tasty! Octopuses are essentially a sac with 8 arms, 3 hearts, 9 brains and blue blood! Secondly, they are highly intelligent creatures. They are known for being able to open containers, squeeze their body through tiny crevices, they can shoot streams of ink in order to get away from predators, they can change colors, and they’ve been known to exhibit multiple personalities. Now we’re sure you’re thinking, why on earth would I want to eat them? And we admit, we understand that thinking, but it truly is one of those creatures you just have to try to understand why they are a world-popular delicacy. Octopuses are mild in flavor, with a similar texture to lobster. Although octopuses can be tricky to cook correctly, we have created a fool-proof recipe that is sure to give you the proper end result! Or you can find another recipe that you think you will find more enjoyable. Each culture has their own way of tenderizing their octopus prior to cooking, and flavors that they feature in their octopus dishes. Now who is completely freaked out? Have we scared you away from Harbor Fish forever? We sure hope not! We are just trying to get into the spirit of Halloween. We hope we have passed on a bit of education, and maybe if you’re a complete dare devil, you will try one of these seafood options! Keep your eyes peeled for our Halloween inspired appetizer that will be sure to freak out your party guests, but taste fantastic! Happy October everyone!